Prime Minister Narendra Modi and newly-elected French President Emmanuel Macron on Saturday issued joint statement at Elysee Palace in Paris. PM Modi said that climate and terrorism are two big threats in front of humanity. "Paris Agreement is joint legacy of the world and it is an article of faith for Indians," said PM Modi. "Many Indian soldiers who died for our country, for its freedom, are very much evidence of strong bonds between our countries. France committed to fighting climate change and will continue, not only within framework of Paris accord also in actions we are implementing. I will be travelling to India by end of the year and we will convene a meeting of the world solar alliance," said French President Emmanuel Macron. Earlier in the day, Prime Minister Narendra Modi met French President Emmanuel Macron and discussed issues of international and mutual interests including ways to enhance the strategic ties, countering terrorism and climate change. The two leaders met at the Elysee Palace, the official residence of the president of France. “A meeting to mark a new warmth and friendship. PM @narendramodi meets new French President Emmanuel Macron in Paris,” Ministry of External Affairs spokesperson Gopal Baglay tweeted along with some pictures of the two leaders. Modi arrived in France from Russia, where he held talks with President Vladimir Putin and attended an international economic forum. Before Russia, Modi also visited Germany and Spain and held talks with the top leadership there. The two sides are expected to issue a joint declaration after the Modi-Macron meeting. 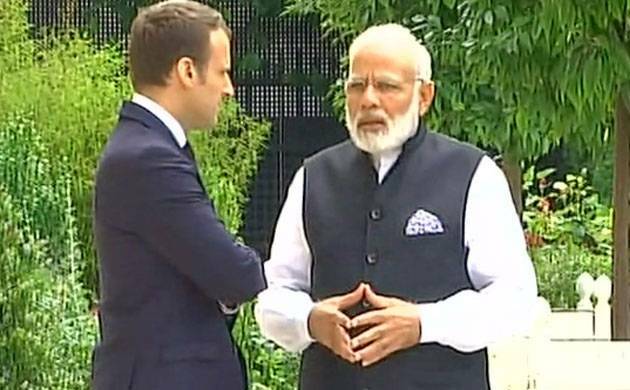 “I would be exchanging views with the French President on important global issues including UN Security Council reforms and India’s permanent membership of the UN Security Council, India’s membership of the various multilateral export control regimes, counter-terrorism cooperation, collaboration on climate change and International Solar Alliance,” Modi had said ahead of the visit. France is India’s 9th largest investment partner. France is also a key partner in India’s development initiatives in areas like defence, space, nuclear and renewable energy, urban development and railways. Prime Minister Modi had also called up Macron to congratulate him on his poll victory and said he looked forward to work with him to further deepen the bilateral ties. 39-year-old Macron created history last month by becoming the youngest president of France.